For retailers and consumer goods firms to thrive on an open platform and a level playing field, they will need to create and apply agreed technical standards for conversational commerce. Voice is the technology for conversational commerce. The technology is still in its infancy. Voice assistants do not yet have a deep, empathic understanding of their owners. But that will change – and fast. Voice is an unparalleled opportunity for brands to build highly valuable and valued personal relationships with consumers, and use this new-found intimacy to drive brand preference and affiliation. Consumers are adopting smart speakers an order of magnitude faster than they did the smartphones. This has resulted in a new, emotionally engaged relationship between consumers and brands. The devices, and the voice assistants that inhabit them, will change shopping forever, creating a new era: conversational commerce. It will accelerate the changes e-commerce is already creating in consumer industries. The application of voice technology in conversational commerce is a relatively new concept in the European market. 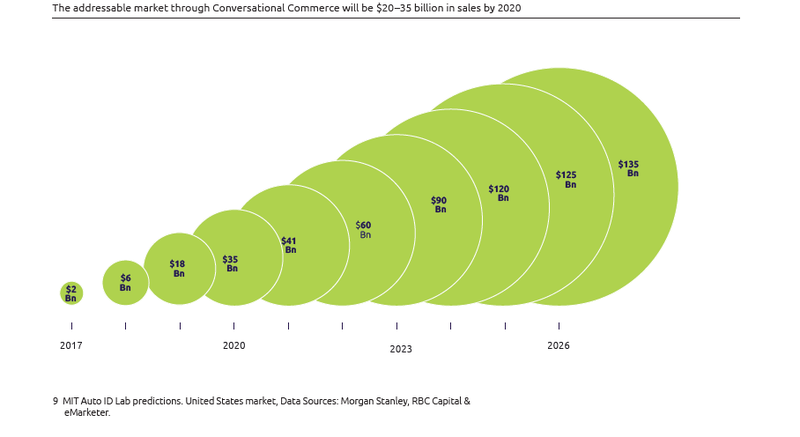 Conversational commerce promises to fundamentally alter relationships between consumers, retailers, and manufacturers – it is the next big battlefield for the space in the hearts and minds of the shoppers. For consumers, conversational commerce simplifies transactions, removing the need to toggle back and forth between devices and websites to gather information and make purchases. Consumers are set to use more than 190 million in-home conversational devices, such as Amazon Echo and Google Home, by 2019. Although not all interactions will be about shopping, the voice platform’s ubiquity and power to manage home and family life will bind consumers to it, playing into the entanglement strategy of digital-native firms. Consumer goods firms and retailers are at the cusp of a revolution. The impact of conversational commerce will be of the same magnitude as the introduction of the first fridges in the homes – perhaps even bigger. Dependency of the big players? The retail market addressable through these devices will reach $35 billion by 2020, but voice-platform owners, including the world’s leading online retailers, will be the gatekeepers to this new source of growth. They will be free to promote any vested interests in retailing and brand promotion, a situation the industry should avoid. Voice-ordering is not just another channel. It marks the era of conversational commerce by creating a new relationship between consumers and brands. Retailers and manufacturers will become providers of curated services and customer experiences that solve problems and engage consumers, whether at home, in the store, or on the move. For conversational commerce to be accepted, consumer industries need to answer some fundamental questions as a group. For retailers and consumer goods firms to thrive on an open platform and a level playing field, they will need to create and apply agreed technical standards for conversational commerce. Otherwise, there is substantial risk that the interaction with consumers will be controlled by a handful of platform providers who can exploit their advantage in digital entanglement to promote their own vested interests. Conversational commerce also requires a common set of behavioral standards – a canon business practice, so the new model of doing business is accepted by both governments and society. We believe that conversational commerce is an overarching strategic business imperative with far-reaching business implications. It goes well beyond the smart speaker and the voice assistant. It requires planning and investments in customer experience, data management, analytics and artificial intelligence, and business operations (especially supply chain). Making a tactical play is a risky option as it could make you less relevant to your customers. Conversational commerce is not just another channel, instead, it may become a primary consumer interaction point for retailers and brand relationships. Feel free to reach out to us for more information or to arrange a workshop on how you can implement technology solutions that seamlessly integrate voice. This blog is part of the “Innovation in Retail” series.